I’ve always been a Microsoft fan even with their Vista debacle. It’s been sad to see for many years Microsoft lose its position as a dominant company losing market share for… complacency. But, I’ve been impressed the last several years as Microsoft has re-emerged as an innovative company. So innovative that several developers and engineers I know have shifted from Apple’s ecosystem to Microsoft’s recently. Microsoft’s re-emergence from several lackluster years have been spearheaded by Satya Nadella, Microsoft’s 3rd CEO who took the reins of the Redmond corp in February 2014. 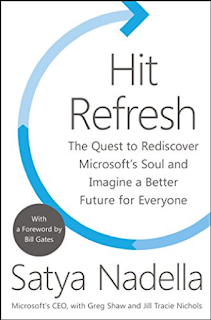 I recently read Satya’s book Hit Refresh to learn about the CEO and hear how he has steered Microsoft’s ship into a bright future. Again, I’ve been impressed with the corporation’s recent changes going against its long-gone dogmatic approach from software licensing to hardware. 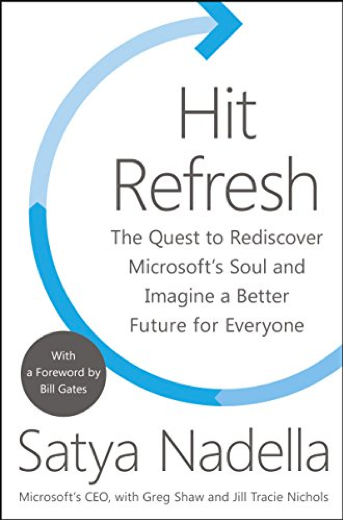 The book is a deep dive into how Satya views Microsoft’s role in the world. This book was written just several years into his tenure. He shares how most CEO leadership books are written after their tenures, but Satya wanted to be open to his company’s employees and shareholders during the process. As the book implies, the approach is welcome and “refreshing”. Satya is very open in the book about his family, and how his family has influenced how he envisions Microsoft’s purpose in the world – its WHY as Simon Sinek would put it. He opens up about the impact of his son, Zain, who is severely disabled. At one of his son’s appointments, Satya describes being in wonder of how Microsoft products were used everywhere in the hospital. It was at that moment he realized the importance and impact his company has in the world helping others. One of the first tasks Satya did when he took over the helm as CEO was to re-engage people. He reached out and spoke to as many Microsoft employees as possible and Microsoft’s partners and customers. If you hadn’t guessed by now, culture is so important to the Microsoft CEO. 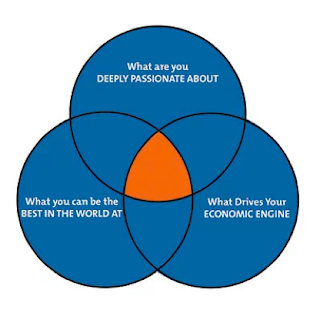 I believe one of the greatest results of Satya’s work and connection to his employees has been building adaptability and agility to the organization. For many years, Microsoft laid stagnant in innovation choosing to stick to its licensing deals and keeping its products away from other ecosystems. Satya saw the larger opportunity with the cloud and changed the company’s many product roadmaps – shifting to subscription-based programs, focus on enabling others with its software no matter the platform (i.e. building new partnerships with Apple, its fiercest competitor). Satya’s bet on the future is largely in three areas: mixed reality, artificial intelligence, and quantum computing. The latter, I still don’t understand. 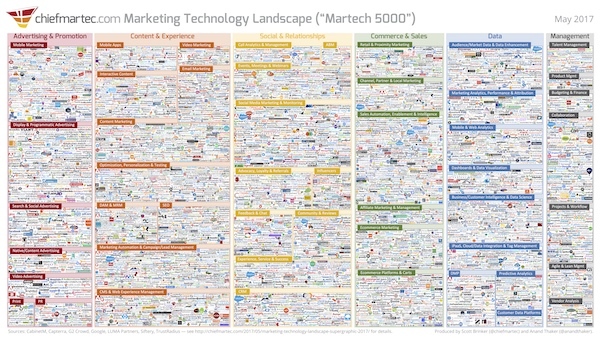 Satya has certainly invested more and more resources into these areas – seeing firsthand the implications of not being a leader in mobile when Apple and Google did. Now, he’s pursuing leadership. This is not a traditional “self-improvement” book I’ve enjoyed in the past. Instead, this book helps highlight a now-CEO. All this being good fodder for me to continually think about as I continue to lead my company.